Walking through the aisles of any Asian supermarket you’ll often see similar if not damn near identical packaging on similar items on the shelves. As near as I can tell, you haven’t created a successful product in Asia until you have people trying to imitate as closely as possible at least by having similar packaging or just flat out copying the name. I think Seattle chocolatier Fran’s has really hit the big time. 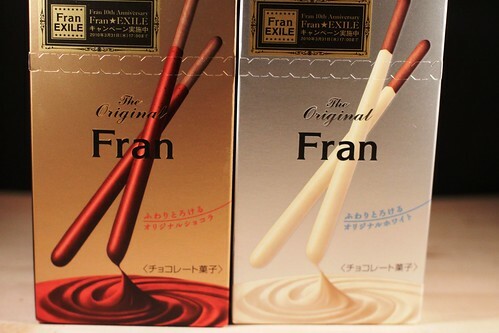 Behold, Fran chocolate coated cookie sticks. They’re actually pretty good, richer in chocolate flavour than Pocky. I just think it’s funny is all. I love Asian marketing.